With their 16th album, Manilla Road have gotten back to basics and returned wholeheartedly to the style for which many know them. On their last effort Playground of the Damned, there was some experimentation going on and combined with a less than perfect production, that led to an album that disappointed long-time Manilla Road fans. There will be no such problem with Mysterium. If anything, some may say this new record plays it too safe. I don't completely disagree, but Mark "The Shark" Shelton and his boys do their traditional sound so well here that only the grumpiest metal hipster would be displeased. And let's face it, there isn't exactly a sea of bands sounding like Manilla Road, is there? It's not like deathcore or stoner rock where bands sound so much alike that they're impossible to tell apart. The production here is much, much better than Playground of the Damned...or just about any previous Manilla album. It is warm and full-bodied, putting strong emphasis on the guitars but not neglecting the other instruments. When the production is combined with the trademark epic metal sound of the band, it makes Mysterium one of the better albums they've done since the heyday of Crystal Logic and The Deluge. An ode to the Norse All-father Odin, this is traditional Manilla Road "battle metal" with a driving chug and heavy guitar sound. It's great to hear both bass and drums sounding full and rich as they do here. That hasn't always been the case on past albums. The album's most aggressive and speed-oriented cut, this piledriver flirts with thrash. The vocal approach is unique, with Bryan Patrick's deep bass voice mixing with Mark Shelton's higher pitched vocals (including a King Diamond-type shriek) to create a different sound. Shelton really shreds on his guitar solo, too. This is just straight-forward head-banging speed metal. This one opens with a very mysterious and understated feel in the fashion of many past Manilla Road tracks. Shelton's typical nasal vocals relate the tale of ghosts reliving an ancient battle. There's a gradual increase in intensity until it becomes a heavy but melodic ballad with haunting vocals and an emotional guitar solo to carry it our. This song is so traditional that it hurts. If there's such a thing as a perfect template for a Manilla Road song, this is it. It's crunchy mid-paced power metal with those ghostly melodic vocals that are a MR trademark. Despite its total familiarity, it's still a good listen. The title is taken from Aleister Crowley and fittingly, this tune has an evil and ominous sound. It's based on a grim and heavy slower riff with echoes of Black Sabbath. There's some real powerhouse drumming here and the whole song just pounds your brain with pure heaviness. Pretty basic headbanging stuff is dished out here but delivered with passion. "If we must all go down in flames / We'll go down fighting in your name.” That's a pretty memorable chorus. This delivers more of the same, with some real crunching riffs and hot soloing but it sounds kind of formulaic in some ways. As with "Only The Brave,” the intensity of the band helps it rise above mediocrity. This upbeat acoustic ballad is a breath of fresh air on the album. It shows another side of Shelton's guitar and vocals. In fact, he feels so natural here that you could easily imagine this being played at a 60s folk jam. The lyrics are also more positive and if any Manilla Road song could ever be called "breezy,” this is it. 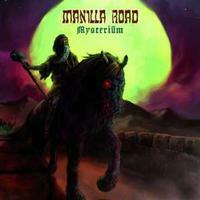 In the past Manilla Road has played with spacey synthesizer soundscapes and this is certainly one of those. It's got a real 70s sci-fi sound to it with some deep and eerie tones. Echoes of Pink Floyd and krautrock abound on this little number. The best was definitely saved for last on this album. What a great track this is...the perfect example of a song that builds and builds to a terrific climax. Like "The Battle of Bonchester Bridge,” this starts with that laid back, haunting balladic style. The interesting lyrics tell the true story of explorer Ludwig Leichardt, who disappeared without a trace while trying to cross the Australian Outback. After a deliberately paced beginning, a mid-paced metallic crunch comes in like a strong wind from a storm. Boy, the riffing here is awesome and the band is at their peak! Shelton kills it on guitar and then there's a great transition to just a huge, majestic riff that really suggests the feeling of mystery the song's trying to get at. There's another screaming solo as the intensity builds. Once the climax comes, the song fades out with a return to the original restrained theme as desert sands blow and wolves howl in the distance. This is an all-time Manilla Road classic.